From the moment he was linked with us Jurgen Klopp gave us hope but since he arrived what has he achieved? For me he has achieved more than I dared hope for, not necessarily with the results on the field we possibly wished for more than three draws and a win but under Rodgers we had fallen so far that it appeared there was no hope and in his short time managing our club he has given me it back, he said in his first press conference that he wanted us, the supporters, to believe and in this short time I already do. In his first press conference he spelled out to us what was expected and what he wanted to achieve, it was music to our ears, he had the supporters eating out the palm of his hand almost the moment he walked through the,door, who could not like his personality and enthusiasm. He has the past achievements, he has the standing in game, he has the reputation now could he prove it at Liverpool. His first game against Spurs and a 1-1 draw away from home, a decent result but more importantly we saw what we had been promised, hard work, pressing and a better organised, more compact team, with people playing in their natural positions. For twenty minutes we looked a class apart but we did appear to tire and allow Spurs back into the game. In just a few days we had seen a big improvement and a tantalising glimpse of what we could become, a fantastic start. At home to Southampton in the league and again big injury problems but the players appeared to be responding more understanding as to what was expected more working harder, better organised and one or two on their way back from injury. Southampton are a strong team but I was still a bit down after a dram fen with injuries but yet again I think we could all see the improvements in the team. A first win for Klopp and a clean sheet with a solid defensive performance against Bournmouth in the League Cup better again a bit more going forward but again very compact a higher defensive line, looking more confident, four games and only two conceded not perfect but a huge improvement and now we had the confidence a win brings. Another step forward and we can now see that when we can get more players back we could start to look like a different proposition. Then against Chelsea, the champions of England at their own ground it came together we fell behind after three minutes and in the past under Rodgers I don't doubt that we would have collapsed but under Klopp no such thing we stuck with our plan, we stuck together and after the first ten minutes dominated the rest of the game, now not only looking compact, working hard, closing down, defending strongly, but now we were attacking quicker, more direct and creating chances and by the end of the game scoring goals three of them against an underperforming Chelsea but still Chelsea the champions. For me Klopp has achieved so much in a few short weeks we now have a compact, well organised team, who are defending strongly and now look like they can create chances, we now appear to be working on individuals who have been short of form or playing within themselves and getting more out of them, this can only help us get better especially as players, big players, return from injury. In a sort time Klopp appears to have united the manager, staff, players and supporters and we all know what happens when we achieve this, nothing can stop us. 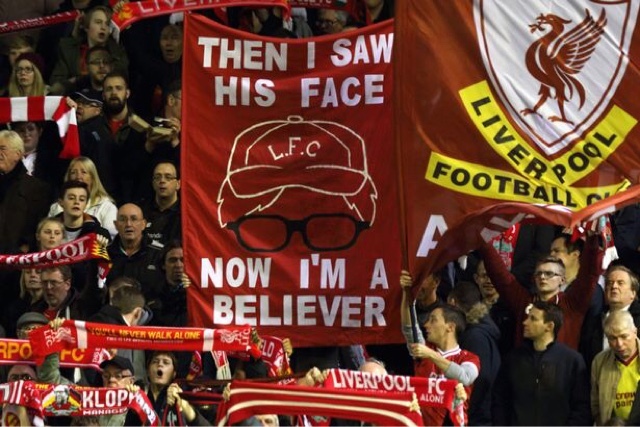 Klopp asked us to believe and I think that now we are all believers.